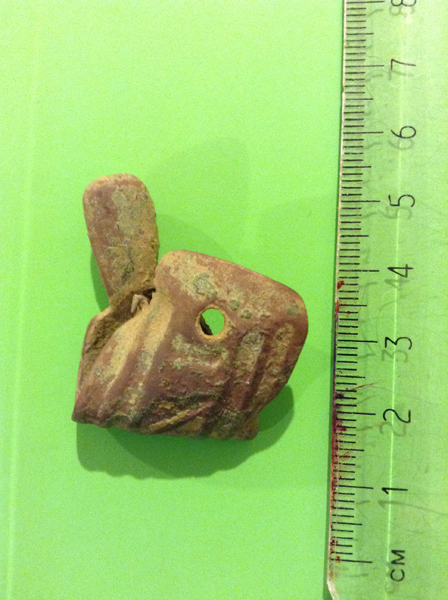 Last week, chatting to some of you lovely peps in my long and tenuously linked to writing post about metal detecting, I mentioned I’d found a strange um… thing. Last beep of the day, heading to the car, I found this. Yep, and here he is again from the back. He looks old and close up he looks as if he was once enamelled. I thought he was cool, in fact I reckoned it was a saint and since he had a pen in his hand, at least, I think that’s a pen, I reckoned it was a gospel writer and therefore, a piece of ecclesiastical bling; church ormalou of some sort. Turns out he is a thing called a Limoges Mount. No, it’s not a wrestling position, stop sniggering at the back. Limoges Mounts were made in, yes, you guessed it, Limoges. Apart from the copper alloy these things were melted onto, all the stuff required to make the enamel was in the soil around the city so enameling was actually quite an obvious choice as an artisan thing for the area. Limoges also enjoyed a geographical advantage, in that it stood at a meeting of roads, including the popular pilgrims’ route to Santiago de Compostello, and there was a big abbey in the town. So basically, the enterprising locals started making holy stuff, boxes, mounts for crosses etc for the pilgrims coming through the town, or stopping at the abbey on their pilgrimage, to buy. They became known for their quality, indeed at one point, the Pope at the time decreed that every church must have a certain number of enamel things from Limoges (clearly not a fan of free trade and I’m guessing Limoges was his home town). 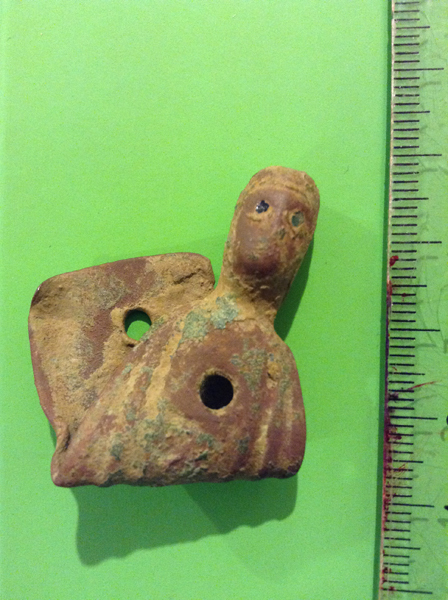 Things like the battered chap I dug up were probably stuck on the sides of boxes as relief elements in scenes or on the mounts for crosses. The thing that has gob smacked me a little is that the enameling trade flourished in Limoges between 1130s and 40s and 1350 or thereabouts… it became very popular in the 12th century but demand was high and the necessity to mass produce them resulted in a drop in quality. Production finally petered out in the 100 years war. Like as not he fell off whatever he was mounted on sometime between then and now — during a harvest celebration, I’d guess. Perhaps they had an outdoor service every year… I doubt whatever item he fell from survived the reformation and if it did, I expect the Civil War (there’s an oxymoron if ever there was one) got it on the rebound. I’ll have to see if I can discover more just in case. It might be that the nearby church would have records. This is all I know so far. That and that he’s quite rare — 7 dug up on the UK Detector Finds Database between 2006 and 2011 — so I have to declare him to my local Finds Liaison Officer… within 14 days… except he’s sick at the moment… next month then. I need to find out what he’s worth, too. So he’s about 800 years old. And I dug him up. Other news. I sent the last two book of the K’Barthan Trilogy off to the Beta Readers today. So it’s off my hands for a month. Well… sort of. I will be listening to Stephen Hawking reading them from inside my kindle to track down any missed words or dodgy commas. Looks as if launch date is going to be June and July then, for deffo. Quite excited about that. Fed up with eating snail and tortoise dust? Join us the #slowwriters.